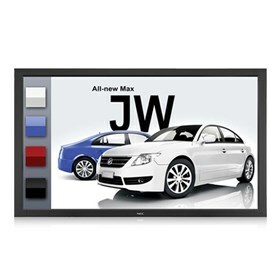 The NEC V552-TM is a 55" LED backlit touch integrated large screen display used for commercial display. The LED backlighting technology reduces power consumption and allows for a slimmer cabinet depth. This monitor's 300 cd/m² typical brightness rating and 4000:1 contrast ratio showcases its ability to handle light and dark on-screen images. The screen have a 1920 x 1080 native resolution as well as 178° horizontal and vertical viewing angles. The V552-TM is equipped with VGA, DVI, DisplayPort, and HDMI ports for connecting a variety of video sources. It also features an interface extension slot for component expansion. This model is equipped with 10W stereo speakers and dual connectors for interfacing external speakers. The NEC V552-TM has many exciting features for users of all types. See the NEC V552-TM gallery images above for more product views. The NEC V552-TM is sold as a Brand New Unopened Item.